ISIS and Jabhat al-Nusrah alliance - a wrench in Obama's plan? Media reports of an alliance between the Islamic State in Iraq and Syria (ISIS) - which calls itself the Islamic State or the Caliphate - and the al-Qa'idah affiliate in Syria known as Jabhat al-Nusrah (the Victory Front), could derail the Obama Administration's strategy to "degrade, and ultimately destroy" the organization. The Obama strategy has been to use American and coalition airpower to support a ground force - which does not include U.S. troops - in the fight against ISIS. In Iraq, that has a possibility of success, after all, there is a standing Iraqi army, supplemented by the Kurdish forces known as the peshmerga ("those who confront death"). The Iraqi army had been trained and equipped by the United States and some of our European allies, at great expense to the American taxpayer. Many analysts were surprised, even shocked, when that U.S.-trained Iraqi army collapsed in the face of the ISIS advance on the northern Iraqi city of Mosul (al-mawsil, Iraq's second largest city). The Iraqi forces, who outnumbered and outgunned the attacking ISIS fighters, should have been able to easily stop and defeat the approaching Islamist forces. Instead, the Iraqi ranks broke, the soldiers removed their uniforms, and abandoned much of their state-of-the-art American-made equipment. That equipment is now in the hands of ISIS, and being used by them - many of the ISIS fighters are former Iraqi army soldiers and capable of using the weapons and materiel. Following the departure - premature in my opinion - of American troops in 2011, there were no Americans on the ground to monitor the status of the Iraqi army. Neither Iraqi Prime Minister Nuri al-Maliki nor President Barack Obama engaged in serious attempts to work out an agreement by which American forces could remain in Iraq. Prime Minister al-Maliki was being pressured by his Iranian sponsors to force the Americans out, and President Obama was anxious to end the American involvement in the country, regardless of the security situation. The Iraqi army devolved from a fairly competent albeit nascent fighting force to a corrupt, undisciplined and hollow organization controlling (and stealing) vast amounts of national treasure. For a detailed description of what happened to the Iraqi military, see my June 24 article, Where is the Iraqi Army? After taking Mosul, ISIS began a well-planned and well-executed military campaign in northern and western Iraq, moving down the Tigris Valley and expanding its holdings in the Euphrates Valley. This prompted an American response - the formation of a coalition and the commencement of air operations against ISIS targets in both Iraq and Syria. The stated Obama foreign policy goal is to "degrade, and ultimately destroy, ISIL" (the government term for ISIS)*. The strategy to achieve that goal is to continue the air operations in both countries, complemented by ground operations. It is the ground operations that are the difficult part of the strategy. The Iraqi army must be re-organized into an effective fighting force - no small task. The initial American assessments of just how bad the Iraqi army has become were worse than anyone had imagined. It was this realization that drove President Obama's decision to double the American troop presence in Iraq, and expand their operations from Baghdad and Irbil (in the Kurdish autonomous region) to training and adviser missions in embattled al-Anbar province. That piece of the plan addresses Iraq, and given time and appropriate American commitment, at least has a chance of being successful. If it is not successful, that raises the possibility of the re-introduction of American combat units to address the threat posed by ISIS. That is an argument for another day. The effort in Syria is much more problematic. The country is involved in a civil war that has raged since early 2011. Over 200,000 Syrians have been killed, hundreds of thousands more wounded, and millions have been displaced to refugee camps in Syria or in the neighboring countries. The Obama plan for Syria is to vet, train and equip "moderate Syrian opposition" forces to fight ISIS. "Moderate opposition forces" generally means the association of groups that comprise the Free Syrian Army (FSA). The FSA is made up of a large number of Syrian military personnel who have defected and taken up arms against the regime of Syrian President Bashar al-Asad. Here is where it gets complicated. ISIS is fighting in Syria to establish its so-called caliphate, the Islamic State. To accomplish this, they have been fighting virtually everyone in the country. That includes not only the Syrian regime, but also the FSA; the Syrian Kurds who occupy enclaves near Aleppo, along the Syrian border with Turkey and the areas of northeast Syria adjacent to Iraq; and Jabhat al-Nusrah. There are other groups in Syria as well, and many have overlapping loyalties, most of them temporary and tactical. In short, it is a confusing mess. There are a few analysts who try to keep track of what is happening with the multiple groups in Syria, but things change daily based on the situation and the many moving parts. That said, there is a major change that might be problematic for the Obama strategy. According to multiple media sources, Jabhat al-Nusrah and ISIS have agreed to a temporary alliance to fight the Syrian regime and any U.S./coalition forces in Syria. Both of these organizations now consider the FSA as part of the U.S.-led coalition. With their combined forces and capabilities, ISIS and Jabhat al-Nusrah pose a real threat to the FSA. In the area around Aleppo where the FSA controlled large swaths of territory, attacks by the Syrian armed forces, ISIS and Jabhat al-Nusrah are taking a toll as the FSA appears to be under attack from all sides. It is a smart strategy for ISIS and Jabhat al-Nusrah - make alliances with those who share a common enemy, or as we Middle East players recite the local adage, "the enemy of my enemy is my friend." When ISIS joins with Jabhat al-Nusrah to fight the FSA, who has suffered from heavy attacks by the al-Asad regime in the Aleppo area, the FSA's chance of survival decreases dramatically. Several FSA units have been routed - they abandoned to ISIS/Jabhat al-Nusrah the new gem in the FSA arsenal - the U.S.-made highly effective TOW antitank guided missile system. If ISIS and Jabhat al-Nusrah are successful in their campaign against the FSA, the Obama strategy, which is already in trouble, might actually strengthen ISIS instead of degrading it. According to public announcements from the Administration, it will take about a year to vet and train a few thousand FSA fighters - that is just too few, too late. With the new ISIS and Jabhat al-Nusrah alliance, the FSA may not survive that long. Here is a key point. The FSA is focused on removing the regime of Bashar al-Asad from power, not the defeat of ISIS. The Obama Administration wants them to fight, well, actually to "degrade, and ultimately destroy, ISIL." These are two distinctly different objectives. If I was the FSA, I would say whatever the Obama Administration wants to hear, accept the money, weapons and training ostensibly to fight ISIS, and then go after the Syrian regime. Anyone who understands the Middle East knows that is exactly what will happen. The next few weeks will tell. 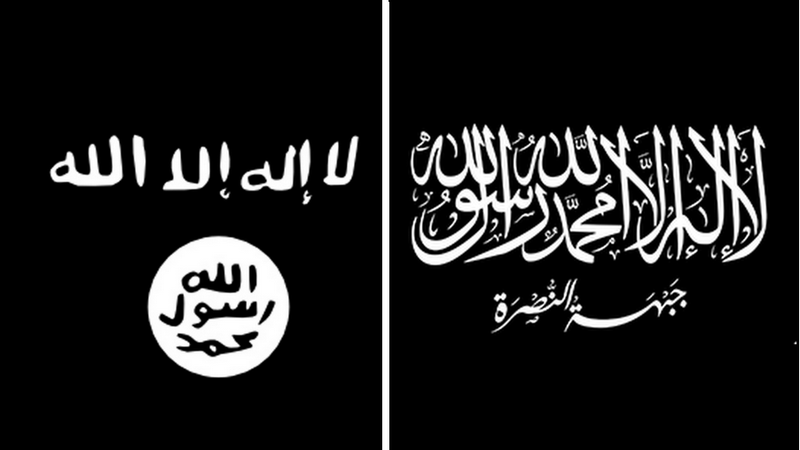 It might be time to recognize the ISIS-Jabhat al-Nusrah alliance and go after both groups. Given the brutal murders of American Peter (also known as 'Abd al-Rahman) Kassig and 20 Syrian air force captives (photo above), they are cut from the same cloth and should be dealt with accordingly. Hopefully, we will hear no more talk of "managing ISIS" from the Administration. 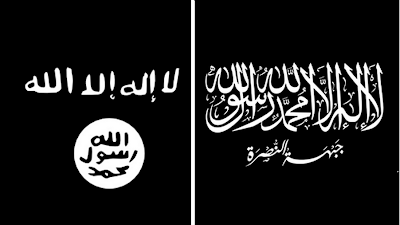 This alleged alliance between ISIS and Jabhat al-Nusrah is a concern. The two groups have significant combat power and could conceivably pose a threat to the viability of the FSA, Obama's chosen proxy in Syria. The FSA is being currently battered by the Syrian army and air force - their stronghold of Aleppo is almost completely surrounded by regime troops. Even if they are successful in holding out against the Syrian forces, now they must contend with the combined power of ISIS and Jabhat al-Nusrah. For ISIS and Jabhat al-Nusrah, this tactical alliance is the smart move. It's what I would do in their shoes. It neutralizes the American proxy threat (the FSA) and removes an impediment to the establishment of a caliphate in the region. * The debate over the terms ISIS versus ISIL revolves around the translation of the Arabic name for Damascus, Syria and the Levant. See my detailed explanation at ISIS versus ISIL - what's in a name? 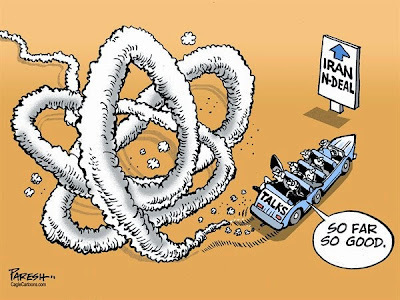 Iranian nuclear talks - maybe time to walk away? The only thing spinning faster than Iran's almost 20,000 centrifuges is the rhetoric coming from both sides of the issue. According to the Iranians, 90 percent of the issues have been resolved. The American negotiator, Undersecretary of State for Political Affairs Wendy Sherman, says "there has been impressive progress on issues that originally seemed intractable. We have cleared up misunderstandings and held exhaustive discussions on every element of a possible text." Amazing - you would think that with those statements from the two participants who matter the most, we are on the verge of a groundbreaking agreement that will end Iran's quest for nuclear weapons and that the economic sanctions on the Islamic Republic are about to be lifted. The talks are nowhere - all the years of "negotiating" (if it can be called that) - have yielded almost nothing positive for anyone but Iran. While the P5+1 (the five permanent member nations of the United Nations Security Council plus Germany) have been attempting to convince Iran to abandon its drive to acquire a nuclear weapons capability, Iran has been aggressively enriching uranium and building a reactor that can produce plutonium. We're talking while they are pursuing two separate efforts to acquire the fissile material required to produce nuclear weapons. Time is and has been on Iran's side. In all of the years of talks on this issue, the Iranians have not agreed to much, and those conditions they they do accept, they violate. It is their strategy - keep the talks going while they develop the materials needed for a weapon. Each and every time the talks are about to collapse and the threats of additional sanctions loom on the horizon, Iran agrees to more talks, or agrees to talk about having more talks. That is what is happening yet again. There are 10 days remaining until the next deadline, another deadline in an series of deadlines. 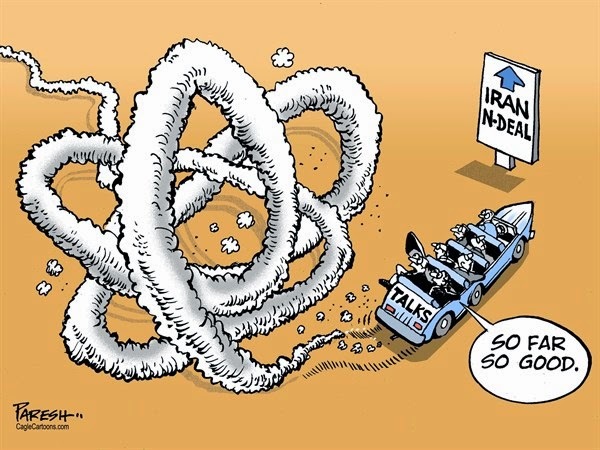 In November 2013, the P5+1 and Iran reached an interim deal - at that point Iran agreed to reduce some of its enrichment activity in return for the easing of some of the economic sanctions. The parties agreed to continue the process for one year, with a new deadline of November 24, 2014. There was a strange mechanism of allowing "negotiations" until July 20, 2014, followed by four months of drafting the agreement. As most Middle East analysts predicted, the negotiating period and drafting period have almost expired, and there is no deal in sight. Faced with the November 24 deadline, there are calls for yet another extension. Yes, the P5+1 will agree to talk, and the Iranians will continue to expand their inventory of fissile material. However, it gets better. Some of the parties are proposing that during the new extension period, there be additional sanctions relief for the Iranian economy, which is in a recession. This is insanity. It rewards Iran's refusal to make any serious concessions in its enrichment activity. The Iranians have learned over the years that their intransigence is usually met with P5+1 concessions. It is the same cycle over and over. Perhaps it is time to tell the Iranians that the time for talking is over, that additional tougher economic sanctions are a virtual certainty in the wake of the Republican gains in the recent U.S. elections, and that under no circumstances will the Islamic Republic be allowed to develop the capability to build a nuclear weapon. President Obama needs to stick to his original position that no deal is better than a bad deal. Here are the conditions, what is your answer: yes or no? A "no" response means the imposition of crippling sanctions we have been promising for years. If that doesn't work, nothing has been taken off the table. Iranian leaders only need look to the west and south - there is a lot of American airpower in the region dealing with ISIS, based in countries that are not favorable to the prospect of a nuclear-armed Iran. If that sounds like a threat, so be it. Today is election day in the United States, the day we Americans elect who will govern the country. It is a right most of us take for granted, and too few of us actually exercise. For those of us who have served abroad in countries that do not have this right, it is disappointing to watch the low turnout numbers. Let me contrast our right to vote with an anecdote about voting in Syria. In the early to mid-1990s, I served as the air attaché at the U.S. Embassy in Damascus. As with any embassy tour, you develop friendships among the local population. Since both my wife and I could speak Arabic, it was fairly easy for us to meet people. One of the couples that we met were a doctor and his wife - great people. We will call them Samir and Layla Fulani. One night we were invited to dinner at the Fulanis' - it happened to be election day in Syria. Samir was a bit late getting home from the state-run hospital where he worked. After his initial greetings to Layla and the children, he sat down and we began a conversation. I asked him if he had voted in the election during the day. He laughed, shaking his head, saying the Arabic equivalent of "what a joke." I asked him what he meant - although I was under no illusion that the Syrian regime of Hafiz al-Asad (father of the current president) was going to conduct free and fair elections. Samir recounted his "voting" experience. The doctor had arrived at the hospital that morning at the usual time. As he was walking across the lobby to his office, the hospital director called out to Samir and asked him to come into his office. In the office were two Ba'th Party officials. I asked Samir how he knew they were party officials. He smiled at me and said, "Oh, you just know." The officials welcomed Samir and asked him if he planned to vote that day. He responded that he was planning to stop by on his way home from work and cast his ballot. One of the officials gave the typical Levantine click of the tongue and remarked that since the doctor was so busy and of course a loyal supporter of the Ba'th Party, that he had taken the liberty of filling out Samir's ballot for him. Before I continue, I want to stress that Samir and I were good friends, so we often "tweaked" each other a bit. So, I asked him how the official had voted? He just nodded and gave me the "I'll get you later" smile. I then asked how he let them get away with such obvious voter intimidation and voter fraud. He asked me, "My brother Rick, how long have you lived here?" I replied, "Long enough to know the answer." That's how the Syrian president is elected and re-elected. Normally in the past, it was a referendum - do you want Hafiz al-Asad, or later, Bashar al-Asad to be the President of the Syrian Arab Republic? Yes or no. In the last election, the system was changed to allow multiple candidates. Who but an approved patsy is going to run against a brutal dictator? The joke in Damascus - and you have to laugh sometimes to get by in these countries - was that after the election/referendum, an aide ran into the president's office and reported that the president had won 99.7 percent of the vote - what more could he want? The president replied, "The names of the .3...."
No matter how many hiccups there are today, and there will be some, at least we get to cast a real vote. Please exercise that right - many of us served in some faraway places to guarantee that you continue to have that right.